This is a BIG, custom made dinner ring, dating from the 1930's. The jewels comprising the ring are thought to have originally resided in a very large, turn of the century family brooch. The ring top measures 17 x 20mm. There are two rows of diamonds surrounding the Persian Turquoise. The outer row is comprised of 18 round brilliant cut diamonds weighing .07ct ea. for a total of 1.26 carats. The inner ring is comprised of 18 single cut diamonds, each weighing .03 cts, for a total of .54 carats. Cumulative diamond weight is 1.80 carats. Diamonds are predominantly SI1 clarity, some VS. Diamond color is top white G-H. The mounted jewels rise above the finger by approx. 15mm. Ring weight is 8.12 grams. The hand made mounting is 14k white gold, unmarked, and acid tested. Ring size is 7 and it can be resized. 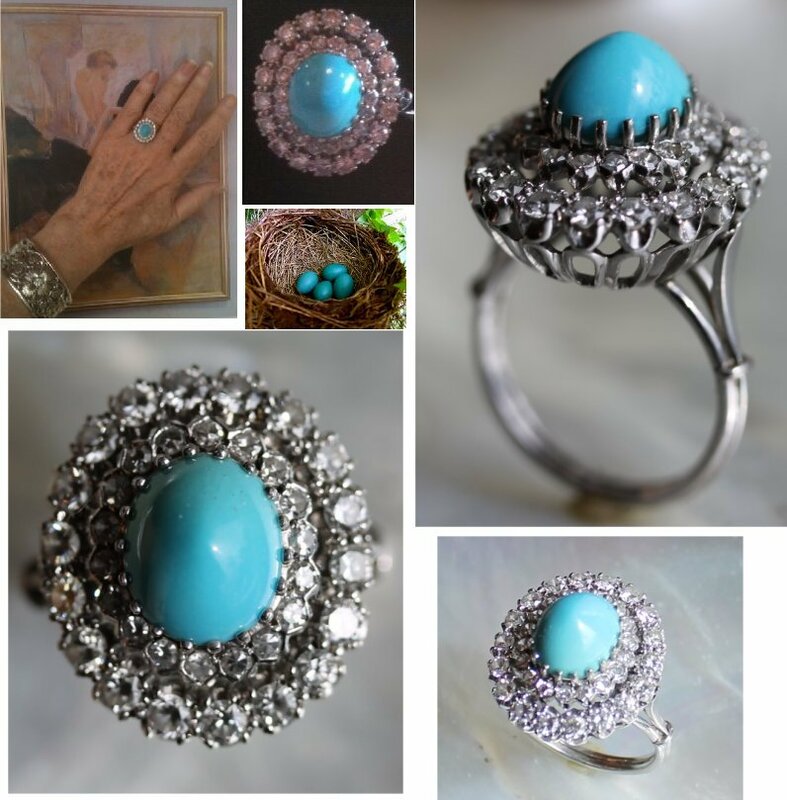 The Persians classified turquoise into three quality groups: Angushtari is first quality, suitable for the finest jewelry. These stones have the rich blue "Persian turquoise" color (also known as Robins Egg Blue) with little marking or matrix, and were mined in the Khorasan province. The subject falls into this category. Persian Turquoise is rare and valuable in finer grades and has been prized as a gem and ornamental stone for thousands of years owing to its unique hue.The substance has been known by many names, but the word turquoise, which dates to the 16th century, is derived from an Old French word for "Turkish", because the mineral was first brought to Europe from Turkey, from the mines in historical Khorasan Province of Iran. In Iranian architecture, the blue turquoise was used to cover the domes of the Iranian palaces because its intense blue colour was also a symbol of heaven on earth. In many cultures of the Old and New Worlds, this gemstone has been esteemed for thousands of years as a holy stone, a bringer of good fortune or a talisman. It really does have the right to be called a 'gemstone of the peoples'. The oldest evidence for this claim was found in Ancient Egypt, where grave furnishings with turquoise inlay were discovered, dating from approximately 3000 BC. Hardness and richness of colour are two of the major factors in determining the value of turquoise; while colour is a matter of individual taste. Generally speaking, the most desirable color is a strong sky to "robin's egg" blue (in reference to the eggs of the American Robin.). We are brick and mortar jewelers with a showroom located in Stuart, Florida. Any dark spots appearing in photos are camera reflections only.